After the financial crisis exposed the devastation caused by predatory lending, state and federal authorities vowed to protect consumers from practices that lured them into debt they couldn't afford. But Congress kept most auto loans — the second largest source of debt for Americans — out of the reach of the fledgling U.S. Consumer Financial Protection Bureau. And now many of the same tactics that led to the mortgage meltdown — like fudging facts on the loan application or charging consumers hidden fees — continue to plague auto loans, an investigation by the Center for Public Integrity found. The politically powerful industry has also mastered a few high-pressure tactics of its own. Chief among them is the "yo-yo," where dealers let buyers drive a new car home in hopes of locking them into a deal and later tell them their financing fell through. The tactic can lure buyers to accept a higher interest rate. And while the financial crisis rendered subprime mortgages extinct, Wall Street is once again buying up bundled subprime auto loans, fueling a market aimed at the most vulnerable consumers and relieving dealers of the risks of making bad loans. The end result is that financial incentives to take advantage of auto shoppers remain unchanged while the agency charged with protecting borrowers will be powerless against an industry polling shows is the most distrusted in America. "I think that's a problem because a lot of fairly unsophisticated people buy cars from auto dealers," said Rep. Barney Frank, a Massachusetts Democrat who co-authored the 2010 financial reform law. "We felt that consumers need protection in this." The National Automobile Dealers Association says that its members face lots of regulation already and didn't need any further government oversight, which it argued would only end up costing consumers. But don't try to convince Tammy Moses of that. The dental hygienist from Oklahoma City trusted her car salesman, a family acquaintance who joined hands with her and prayed for her troubled son. He found creative ways to finance a 12.25 percent loan in 2007 despite Moses' lousy credit rating. But for some reason he limited her choice to only two cars on the lot. She fell in love with a sleek, new Hyundai Elantra, despite her father's warning that the car looked a little askew. On a trip to Dallas two months later, Moses lost control of the Elantra as she veered to avoid a car swerving into her lane. When a mechanic suspended the car on the rack, he immediately spotted rusted damage from an earlier wreck. Punching the car's ID into the computer turned up a previous owner from Georgia, according to an interview with Moses and court documents. She learned through court proceedings that the dealer, Automax Hyundai South, routinely got duplicate "certificates of origin" from the automaker to sell used cars as new. Lying about the car's true value mirrors the inflated appraisals that contributed to the mortgage crisis. Moses's case exposed other problems reminiscent of the days of mortgage mania. The income reported on her loan application was bogus, three times the actual amount. And dubious fees meant that she was charged $22,000 for a $15,000 car. A jury recently awarded Moses $400,000, concluding the dealer committed fraud. The dealership didn't appeal and hasn't responded to requests for comment. It's the sort of lending horror story that now sounds familiar. But car dealers will continue to live by the old rules under a last-minute political deal in Congress last year that freed the industry from the Dodd-Frank financial reform law. Elizabeth Warren, the Harvard professor now advising President Barack Obama on setting up the new consumer agency, said at the time. that dealers were sending a cynical message: "We still want to be able to do the old contracts that nobody can read and nobody can understand and still have all the tricks and traps." Frank told the Center in an interview that most lawmakers don't know the same sort of tactics used during the mortgage crisis are being used in auto loans and that dealers' exemption to the Dodd-Frank law was a "mistake." Dealers mounted a political offensive in lawmakers' home districts that ultimately prevailed. "Auto dealers are an example of the most effective lobbying force, a built-in grass roots network... There are auto dealers in everybody's district," he said. It comes as no surprise that Americans distrust car dealers. A Gallup poll for the Better Business Bureau in 2008 showed that only 13 percent of Americans trust car dealers. No other business garners so much distrust. But industry whistleblowers say that shoppers would still be shocked if they could listen to some of the private conversations they've heard. John Callahan said in his three years selling cars on dealer Web sites he was troubled by the sales techniques he saw taught. "They were teaching you how to steal money from the consumer and hide the fact." He remembers a case where a salesman overcharged an elderly woman $2,500 on a car and cheated her $5,000 on her trade in. As she drove off the lot, everyone was high-fiving the salesman. "'You just destroyed her. That's awesome,'" Callahan recalls his colleagues saying. "And the management would laugh about it." The pressure to squeeze each customer can be intense, said Ray Lopez, a car salesman for 33 years. One major dealership in Southern California, he says, automatically fires the bottom three salespeople each month. It's not enough just to make a sale, Lopez said. You're expected to score big each time. He got fed up one day after his boss chewed him out for selling a used car to his brother with only a $500 markup. "He calls me into his office and good God, I've never heard anybody cuss up such a storm. ‘You gave your brother a house deal? If you can't f—- your own family and brag about it, you don't belong here.'" Consumers are much more savvy today about how to negotiate the price of a car, but industry insiders say shoppers remain largely ignorant about what to do when they walk into the finance manager's office. While the consumer thinks the negotiations are over at that point, dealers know that a lot more profit can be made off the financing. For starters, dealers routinely jack up the interest rate on a loan and split the profit with the lender. So if you qualify for a 4 percent loan, the dealer will say the best he can do is 7 percent. Half of the extra profit goes to the dealer as a "markup." Buyers never know they've been charged more because the markup usually isn't disclosed. The Center for Responsible Lending calls these "kickbacks" and calculates that they cost car buyers $20 billion a year. "Auto lending is the only major lending where this still occurs," said Chris Kukla, the group's senior counsel. "It's time for an end to it." A similar practice was also routine in the mortgage business, where brokers would earn higher commissions for inflating the interest rate. This help put borrowers into loans they couldn't afford, and the Federal Reserve has now outlawed the practice. Strong incentives remain that tempt dealers to gouge car buyers. Most dealers don't keep loans on their books, so they face few consequences if the borrower can't afford the payments. And while Wall Street investors won't touch mortgages, they continue to buy bundled auto loans from finance companies, even risky subprime car loans. Loans to subprime customers — those who have low credit scores because they may have a history of missed or late payments — have been on the rise. Subprime loans now account for more than one-third of the new and used auto-loan market, according to the credit rating agency Experian. General Motors last year bought the subprime lender AmeriCredit Inc. to expand sales to financially troubled borrowers. That lender reports that 9.2 percent of its loans went into default last fiscal year, the same rate as before the crisis in 2006 and during it in 2008. The explosion of consumer debt has compounded the risks for borrowers. Most car shoppers now owe more than their trade-ins are worth, limiting their borrowing options and making them especially vulnerable when negotiating a car loan. Deals today routinely include costly GAP insurance, which in the event of a catastrophe covers the difference between what the car is worth and what is owed. And with lending companies willing to finance up to 125 percent of the car's value, dealers have room to sell costly and often dubious extras, such as duplicative extended warranties or service contracts. David Stivers, a former auto finance manager who now works as an expert witness for consumer lawyers, said that subprime car loans often bury the consumer in debt. The amount still owned on the trade-in is added to other extras and hidden fees, so that the buyer will never have any equity in the car and may be unable to afford the loan, he said. There are even worst schemes, such as charging for equipment not on the car, lying on the loan application or not being honest about the car's history. For desperate customers, Stivers said, these practices are "like taking food off the table… You overcharge a poor person and you are taking away things they really need." Losing your car can be more devastating than losing your house, contends consumer advocate Rosemary Shahen, who started the nonprofit Consumers for Auto Reliability and Safety. "People do lose jobs because they've lost a car," she said. "Your life just falls apart." One controversial but common technique is called the "yo-yo." That's when a buyer drives a car home with a signed contract, but the dealer calls days or weeks later to say that the financing fell through. Yo-yos give the dealer tremendous leverage to coerce the buyer into paying a higher price or interest rate even after the deal has been inked. Consumer lawyers say yo-yos violate the terms of the sales contract as well as Truth in Lending laws. But Bob Balderston, owner of Blue Springs Ford near Kansas City, Mo., told the Center that a yo-yo is necessary as a convenience for the customer, so they can close a deal on a Saturday night when the banks are closed. Yo-yos are good for dealers, too, Balderston said, because it keeps the buyer from shopping around once an offer has been made. Research by the Center for Responsible Lending shows that one in eight car buyers making less than $40,000 have experienced a yo-yo deal. For those making less than $25,000, the incident rate rises to one in four. Antuane Barnes knows how it feels. Nearly two months after he bought a used Dodge Ram pickup from Norman Chrysler-Jeep in Norman, Okla., Barnes was told the financing had fallen through. Barnes was willing to return the truck, because he found one just like it for a better price elsewhere. What's more, the other dealer was willing to give him $2,000 for his trade in. The Chrysler dealer had paid only $800 for it. Barnes says the finance manager agreed to have the trade-in waiting for him when he got there. But when Barnes arrived, the finance manager claimed they no longer had his old vehicle - a claim Barnes says doesn't jibe with car title records. All they'd offer him was a $800 check. Feeling he was being conned, Barnes says he angrily decided to keep the pickup and stormed out of the dealership. Days later, Oklahoma City police officers rang Barnes' doorbell. Soon, they had him in handcuffs and were leading him down the block to their patrol car as neighbors watched. The dealer had reported the truck stolen. Barnes told the officer what had happened, and in the police incident report the officer concludes that it was probably not a criminal matter. Even so, Barnes says one of the officers insisted that he allow his home to be searched, or else they would have to take his wife and 2-year-old daughter down to the station with him for questioning. Barnes relented, and police allowed a repo man to drive the pickup truck out of his garage, back to the dealership. Norman police Capt. Tom Easley blamed the mistake on a junior officer who didn't ask enough questions. "What is not in that original report is the fact that he had a trade-in that the dealer still had. Once we found that out we said, ‘Wait a minute. This is civil.'" But the initial police report in fact does mention the trade-in. And officers at the scene said in their report that they didn't arrest Barnes because they concluded it might be a civil matter. Easley said stolen vehicle reports from dealers are a common occurrence and raise red flags, so police departments probably should review them carefully. Brian Pritchard, the general manager who reported the car stolen, declined to respond to Center requests for comment. In court filings, the dealership denies the deal was ever consummated. Barnes is now suing Pritchard and the dealership for fraud and says, "I've lost a little bit of faith in people." Similar lawsuits involving police being summon by dealers in yo-yos have been brought in Michigan and Maryland. Although Norman police now say the initial report was incomplete, Easley said charges for filing a false report are unlikely, saying, "We reserve those for very special cases, those that are generally a slam dunk." 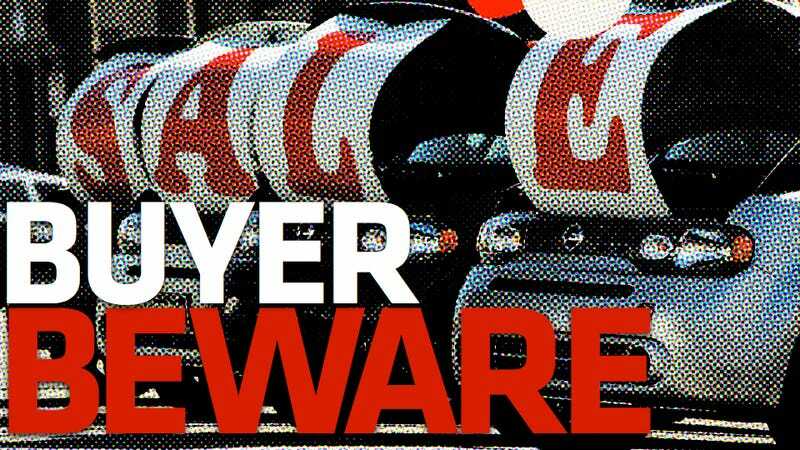 Consumer activists contend new federal oversight is necessary because state and local authorities rarely take action against car dealers, even when there's substantial evidence of fraud. The lack of prosecutions of auto dealers for fraud has become a lifelong obsession for Bernard Brown, a consumer lawyer in Kansas City. Now a leading authority on car fraud, Brown says it's easy for dealers for hide bogus charges in the finance papers so that most consumers don't even realize what they've paid. But even when a fraud is discovered, like a rebuilt wreck, dealers rarely get prosecuted. Brown began representing consumers after a National Highway Traffic Safety Administration investigator told him how prosecutors refused to file charges against a dealer who had sold 75 rebuilt wrecks. He himself became the victim of an odometer rollback years ago and having once worked in a prosecutor's office thought he had an easy criminal case against a car dealer. "I had him dead," Brown recalls. "But the local prosecutor would not prosecute the case." In his research, Brown subpoenaed records on all rebuilt wreck complaints to the Missouri Attorney General from 1990 to 2003. It showed that despite receiving 351 complaints against franchise dealers, the office had only brought two lawsuits. By keeping the wreck secret, dealers are also defrauding the lenders by inflating the value of the car. Similar tricks were played by mortgage companies leading up to the financial crisis. Michael and Kimberly von David called Brown in 2002, after discovering problems with a Ford Ranger pickup they'd bought from a major dealership, Blue Springs Ford. Von David had popped the hood and found clues that the bolts attached to the frame were all off center. A mechanic friend slid under the truck and instantly reported that the truck had been in a serious accident and wasn't safe to drive. The von Davids' complaint became the lawyer's fourth case against Blue Springs Ford for selling a rebuilt wreck. When it finally went to trial last year, Brown emphasized during the penalty phase the dealer's long history of selling rebuilt wrecks and the lack of regulatory and law enforcement against dealers. The jury came back with one of the largest judgments ever for car fraud, awarding the von Davids $170,000 and an additional $1.75 million for punitive damages. Bob Balderston, owner of Blue Springs Ford, acknowledged selling the pickup without disclosing the damage was a mistake, but he says the salesman just didn't know. "We thought the jury went way over the top," Balderston said. He is appealing the verdict. With little enforcement against auto dealers by state and federal authorities, consumers are left to taking their cases to court. But that's rarely an option either. Kathi Rawls, the Oklahoma City attorney who handled cases for both Moses and Barnes, says she gets about 15 to 20 calls a week for auto fraud and has to turn most of the potential lawsuits down. "I can't afford to take them," she laments. Cases can be extraordinarily complex and damages small. Said Jane Santoni, a consumer lawyer from Maryland, "There are really no penalties for these rip-offs. We've tried to strengthen these statutes but the legislature is not listening." A U.S. Supreme Court decision underscored how paltry the penalties can be when car dealers cheat customers. Bradley Nigh was told by a dealer in Virginia that the financing on his SUV had fallen through. According to the court decision, the dealer, Koons Buick Pontiac GMC, also "falsely told" Nigh that his trade-in had been sold, which put pressure on him to sign a new contract. When he did, the dealer charged Nigh $965 for an alarm system that wasn't on the SUV. Nigh sued and the case went all the way to the Supreme Court in 2004. But in an 8-1 decision, the court ruled on highly technical grounds that the most Congress allowed for Truth-in-Lending violations in certain consumer credit cases was $1,000. In recent years, dealers have made it more difficult for consumers to go to court by burying mandatory arbitration clauses in contracts. That means consumer complaints often have to go before a private arbitrator who's not bound by court rules and whose decision cannot be appealed. Ironically, in 2002 auto dealers managed to persuade Congress to enact a law barring auto manufacturers from forcing disputes with dealers into arbitration. Duane Overholt, a former car salesman who now runs a nonprofit website called StopAutoFraud.com, is swamped with complaints from consumers. But because of arbitration clauses and other drawbacks, he said lawyers turn down 98 percent of his referrals. Dealers say there are plenty of regulations already to protect consumers. The National Automobile Dealers Association lists six federal laws or regulations that impose rules on auto dealers, from laws against discrimination, unfair and deceptive practices and withholding the terms of the loan. But Jack Fitzgerald, the owner of a group of dealerships in the Washington, D.C. area, said new rules would not make a difference because like the existing rules, regulators won't enforce them. "The reason things are so bad now is that regulations are being ignored," Fitzgerald said. Fitzgerald, who posts factory invoices on his website, advises buyers to educate themselves. Manufacturers pressure dealers to make as many sales as possible and show no concern for assuring repeat business, Fitzgerald said. To avoid getting ripped off, he advises buyers to shop around and get three competing offers before making a purchase. Good advice. But Tammy Moses's case shows that some scams may be unavoidable. Her attorney discovered that Automax Hyundai got 51 duplicate certificates of origin in 2007, including 22 for new cars that the dealer had yo-yoed. "We contacted all 22 of them, and they were all mad," said Rawls. Still, none of them have filed a lawsuit. Said Rawls, there just doesn't seem to be much point. This story originally appeared on The Center For Public Integrity on April 11, 2011, and was republished with permission.